Are you looking to bring a new and profitable dimension to your career?Do you have key insights, experiences and growth opportunities to share?Would you like to inspire and impress with charismatic speaking skills?We all have a unique skill set, a personal toolbox of knowledge and insight, but not all of us know how to leverage those skills for maximum effect. Using a powerful method for unforgettable impact, Oliver Medill has delivered life-changing presentations to thousands of executive, corporate and professional clients and in this book he shares with you the secret of the ultimate in personal branding. 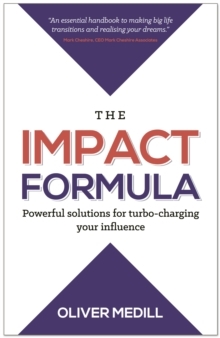 The Impact Formula will give you the tools to create your own Intellectual Property and transform it into inspirational presentations. Learn how to:* Speak with passion and charisma* Build unstoppable confidence with a growth mindset habit* Package your knowledge into content that's easy to teach, understand and learnShowing you how to revolutionise your career in a series of simple steps, this book will consolidate your brand identity, transform your confidence and maximise your impact at all levels.